I almost didn’t make these cookies and what a loss it would have been. There were too many obstacles.. for one a migraine and second too tired after a long week and third we had no chocolate chips except the white one and the dark brown sugar we had at home had turned into stone..but where there is a will, there is a way. I am talking about my daughter’s will here :). You will not see a step by step picture here simply because I didn’t think they will be worth posting..but one bite into these cookies and they changed my mind. This is the BEST cookie I have ever had in my life.. no kidding.. They were soft,chewy and gooey.. YUM. I could have finished the whole batch but I stopped after two..ahem…actually three.. 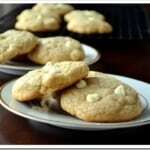 Since I was pretty sure that this will not turn out great, I made a small batch so this recipe will yield you around 15-16 cookies. That’s a perfect number for me, because if I have three dozen cookies at home, I will eat them for all my meals and put on like 10 pounds in 2 weeks. 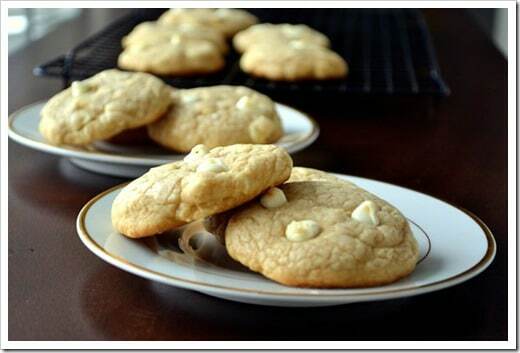 This recipe is adapted from Martha Stewart’s website and here is my version for the quick, easy and completely ADDICTING White chocolate chip cookie. In a bowl, whisk together the flour, salt, cornstarch and baking soda. Set up an electric mixer with the paddle attachment.Add butter (microwaved for 10 seconds) followed by both sugars.Beat on medium speed until light and fluffy. Stop and scrape as needed. Reduce speed to low; add vanilla and eggs and beat till they are combined. Add the chocolate chips and mix them for 15 seconds. You are ready to bake. Line a cookie baking sheet with parchment paper;Use an icecream spoon to scoop cookie dough and place them around 2 inches apart on the baking sheet.